Just a few photos from today's walk, Monty the doodle just loves the chance to combine chasing the ball with a swim in the lake. He now goes in quite deep. He has always been keen on the water, but gradually got braver and braver. Today a German Shepherd chased him in but stopped when he got out of his depth. Monty carried on regardless. His fur is rather like velcro, and he picks up half the park on these walks and then sheds it around the car and the house! Lots of panting after a long run chasing the ball means lots of gratuititous shots of his ginormous tongue! After a run around the park he starts to tire and then has a swim and he is raring to go again. 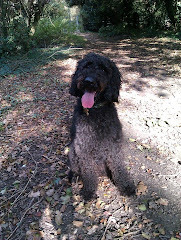 We all had a lovely walk today, I hope you enjoyed the photos.